Where to begin? You’re going to need to close the door to your office, or hole up in your cubicle, or say your dog ate your car keys … I don’t know. But you’re going to need more time than usual to process what happened this weekend in the NFL. Let’s see. Start with David Letterman roasting Peyton Manning, and his hometown. Then there was Indianapolis booing Roger Goodell, loudly, at the Manning lovefest. Then the Vice President of the U.S, who claims to be a Manning fan, wasting hundreds of thousands of taxpayer dollars on a political stunt that overshadowed (to put it mildly) the retiring of Manning’s number on Sunday. 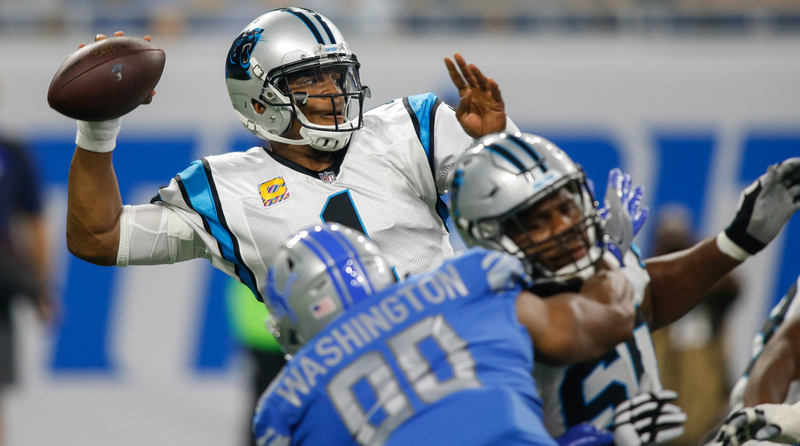 Then Carolina’s Cam Newton, with just a little pressure on him, playing one of the best games of his career, highlighted by one of the oddest, coolest plays he’s made. Then Philly’s Carson Wentz absolutely steamrolling the Cardinals in what may have been the best game of his shiny young career. Then Ben Roethlisberger saying, “Maybe I don’t have it anymore,” after the first five-interception game of his 210-game NFL career. More? Then Odell Beckham Jr. fracturing his ankle and possibly being lost for the season. Then Beckham in tears. Then the Giants falling to 0-5. Then the Jets winning their third straight; their record (3-2) says they’re better than Oakland and Dallas. Then Green Bay playing a classic for the time capsule, capped by not-quite-a-Jared-Cook catch by Davante Adams—stunningly back from the Danny Trevathan car crash 10 days earlier to win with 11 seconds left in The House That Jerry Built. Then Jones saying any Dallas Cowboy who doesn’t stand respectfully for the anthem will not play for the team anymore. You want more? Then three-time Defensive Player of the Year J.J. Watt breaking a leg bone and likely being lost for the season—again—and even the biggest Watt fans wondering: Will we ever see his greatness again? Then Watt on the verge of tears. Then the Chiefs moving to 5-0, with blinding speed everywhere, and beginning to distance themselves from everybody who’s pretty good. Then Deshaun Watson, in his fourth NFL start, throwing for five touchdowns against the best team in football. Then the realization that Alex Smith is the most valuable player in the game after five weeks. Then a shadowy, weird, unconfirmed video emerging just before midnight depicting a man, supposedly Dolphins assistant coach Chris Foerster, snorting some white powder while talking luridly to an absent female friend—before going into a meeting. 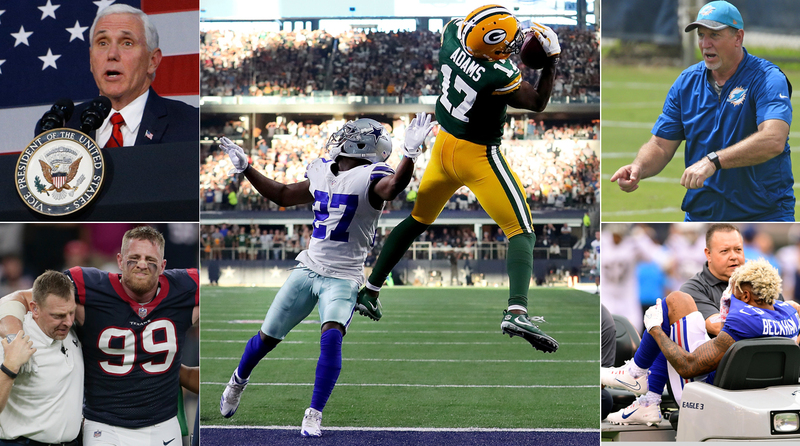 Clockwise from top left: Vice President Mike Pence, Packers WR Davante Adams, Dolphins offensive line coach Chris Foerster, Giants WR Odell Beckham and Texans DE J.J. Watt. There have been some crazy weekends in my time covering the NFL. But this one was a combo platter of “North Dallas Forty” and “The Situation Room” and whatever show has grisly injuries you do not want to see but cannot look away. So we’re going to be here for a while, starting with the happiest man, and most relieved man, on the Green Bay Packers’ charter on the tarmac at DFW Airport just after 9 Sunday night. Andy Benoit and Gary Gramling wrap up the Sunday action each Monday morning on “The MMQB: 10 Things Podcast.” Subscribe on iTunes. “Did you see the play?” I asked. 2013: Green Bay 37, Dallas 36. 2016: Green Bay 34, Dallas 31. 2017: Green Bay 35, Dallas 31. I guess there’s not much to say when the Cowboys and Packers play deep in the heart, except this: Take the over. And this: Bet on Rodgers. The Cowboys made one big mistake down the stretch as they took a 31-28 lead with 73 seconds left in Sunday’s game: That’s way too much time for Rodgers. Green Bay had one timeout remaining with 1:24 to play when Dallas, inexplicably, threw an incomplete pass, stopping the clock at 1:18. The Cowboys scored a touchdown on the next play, but instead of the Packers getting the ball with maybe 40 seconds and one timeout at, say, their 25-yard line, they took it down three with 1:13 left. Rodgers, with time, methodically and calmly moved the Packers to the Dallas 12 with 16 seconds remaining. On the previous play, Adams, an angular and athletic 6'1" receiver earning Rodgers’ trust more and more, lined up wide left on rookie Dallas cornerback Jourdan Lewis. Lewis was stride-for-stride with Adams, and Rodgers overthrew his man. Back in the huddle, before Rodgers called the play, Adams had a message for him. Adams’ assignment was the same—line up wide left, take Lewis to the left side of the end zone … and wait. On the previous play, Rodgers threw a fade out of the side of the end zone, and Lewis’ coverage was good, and it wasn’t close to being completed. The second pass was designed as a back-shoulder throw. “Aaron threw it a little higher, and behind me,” Adams said. “He threw it in a great spot. The first one I saw a little later. The second one was in a perfect spot.” Rodgers threw it three-quarter delivery, calmly, to a spot Lewis couldn’t reach—high and just slightly behind him. Lewis turned back awkwardly and flailed at the ball, and Adams plucked from just over Lewis’s head. Touchdown. With Rodgers throwing the ball the way he does in Dallas—and practically everywhere—miracles for Green Bay seem a tad more commonplace. Vice President Mike Pence walked out of the 49ers-Colts game Sunday in Indianapolis, where Peyton Manning was being inducted into the team’s ring of honor. When Peyton Manning was drafted by the Colts in 1998, Mike Pence—born in Indiana, raised in Indiana, college-educated in Indiana—was a conservative talk-show host and avowed Colts fan. When Pence was elected to Congress in 2000, he moved away from Indiana for the first time but continued to root hard for the Colts in the Manning glory years. When Pence was elected governor in 2012 and Manning left for the Broncos, Pence continued to root for Manning when he played the Patriots, presumably because of the rivalry between the Colts and Patriots; Pence even tweeted his best wishes to Manning before a Denver-New England game several years ago. 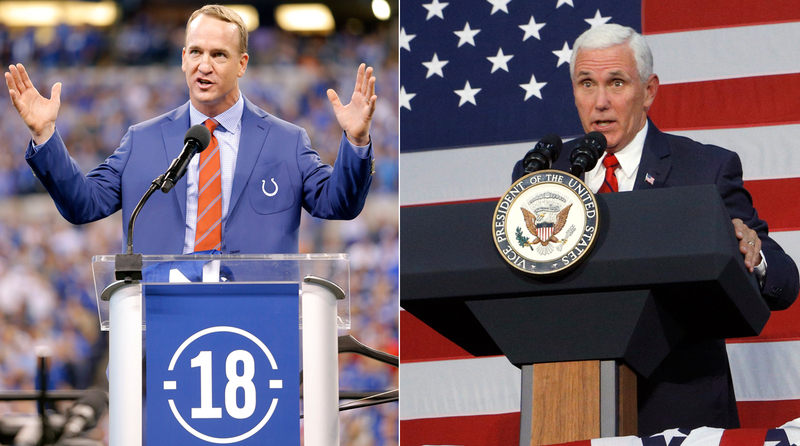 So it surprised no one when Vice President Pence announced last week that he would be attending the ceremony in Indianapolis on Sunday when Manning’s number would be retired at halftime of the Colts-49ers game. Pence would be in Las Vegas on Saturday to honor the victims of the murderous gun rampage there, and he would be moving on to California for a vice presidential appearance on Monday, but he would fly on Air Force 2 with his traveling party for the 1,600-mile trip from Las Vegas to central Indiana to pay tribute to Manning at his halftime ceremony. With Pence’s trip, of course, there would be a traveling press pool of about 20 and a traveling Secret Service detail of approximately 10 with Pence and about 20 more doing advance work to sweep Lucas Oil Stadium and the Indianapolis hotel where the VP’s party would stay on Saturday night and Sunday morning. There would be an ambulance in front of Pence’s motorcade and a trauma team on alert at a local hospital. There certainly would be other manpower needs associated with a vice presidential trip, at a significant cost to U.S. taxpayers. Meanwhile, at some point during the weekend, President Donald Trump and Pence spoke, and Trump told Pence—he admitted as such on Twitter—that if there was a demonstration with players kneeling during the national anthem on Sunday, Pence was to leave the stadium. If there was one certain thing at the 49ers-Colts game, it was that some 49ers would demonstrate during the anthem. This is the only team since the start of the 2016 season to have one or more players either sit or kneel for every game—preseason and regular-season. There was absolutely no chance that this game would go off with 45 Colts standing on their side of the field and 45 members of the Niners standing on their side of the field. For at least the previous 26 games that the 49ers played, first with Colin Kaepernick sitting and then kneeling, and this year with safety Eric Reid leading players in some form of demonstration, the team did something during the anthem. Last week in Arizona, about 30 players kneeled. So why did Pence show up? This was a fait accompli—that some Niners would kneel, that Pence would walk out, and that it would turn into the story of the day in the NFL. And in the process, it would cast a gigantic shadow over the ceremony Pence even tweeted about Sunday morning. Unless he was tone-deaf and had zero press people on his staff telling him, “The 49ers are going to kneel, Mr. Vice President,” Pence knew he would be leaving and joining his boss in chiding NFL players for demonstrating during the national anthem. No popular headline about Manning’s number 18 retired by the Colts or his induction into the team’s ring of honor. Judge for yourself about the motives of Pence, a native Hoosier, at the glorious celebration of one of the greatest athletes in the history of the state. He could have stayed away from Lucas Oil Stadium on Sunday. It's a disgrace that Pence copied his boss and hogged a spotlight he had no business even sharing, never mind owning. But the Vice President of the United States slapped Manning and Pence's beloved Colts in the face. Whether he's a puppet for the President or his own man, Pence trumped a day that belonged to the greatest football hero the state of Indiana has ever seen, and he did it for political purposes. He stole Manning's last great day as a Colt. Mike Pence will have to live with himself for that. Cam Newton has now thrown for three touchdowns in back-to-back weeks, both resulting in wins for the Panthers. • Random thought of the week. The Cleveland Browns, in the past two drafts, bypassed Deshaun Watson, Carson Wentz and Jared Goff. Those three are seventh, ninth and 12th, respectively, in the NFL in passer rating this morning … with a combined touchdown-to-interception differential of 29 to 10. The Brown had better love one of the quarterbacks coming out in the draft next April. • The Texans have scored 91 points in the last two games, a two-game franchise record. 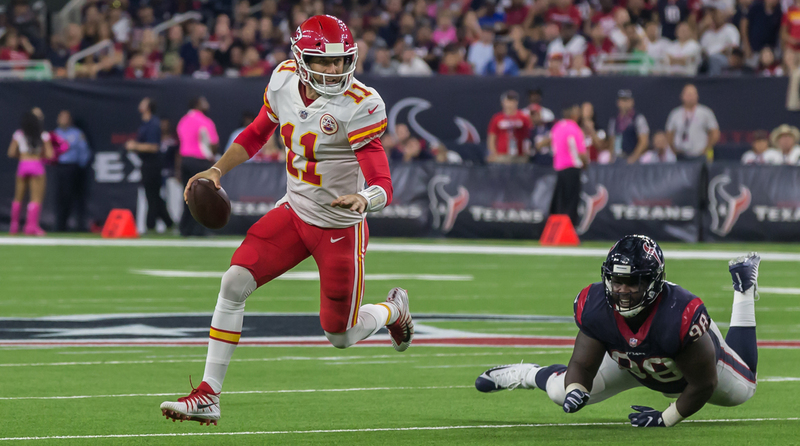 • Watson has thrown nine touchdown passes in the past two games. It’s weird to simply move on after injuries like that. Weird and cold. But that’s the business of the NFL. • Todd Bowles is not feeling vengeful. The Jets coach would be within his rights to tell the geniuses on my side of the business (including me) how we had his team all wrong. I gave him that chance after the Miracle Jets, with a 17-14 win over Cleveland, moved into a three-way tie for the AFC East lead (Buffalo 3-2, New England 3-2, Jets 3-2.) Vengeance? “I don’t have time for that,” he told me from Cleveland. “It’s a long season. And everyone else’s goals are not our goals.” Lots of upset specials in the NFL this season, but the Jets being above .500 in October is one of the biggest surprises. Bowles was bullish Sunday on quarterback Josh McCown, the 38-year-old veteran of 10 pro teams. Sunday marked the first time in McCown’s career that he’d won three NFL starts in a row. “We love him,” said Bowles. “He is perfect for our team. He has meant everything to us. He’s a leader for guys all over the team.” McCown’s 71-percent accuracy has been huge, as has his ability to instill some instant chemistry into a bunch of new receivers (Jermaine Kearse: team-high 22 catches). This should be fun if not necessarily a work of art: Jets-Patriots in New Jersey on Sunday for the AFC East lead. Never thought in 2017 I’d be writing that sentence. 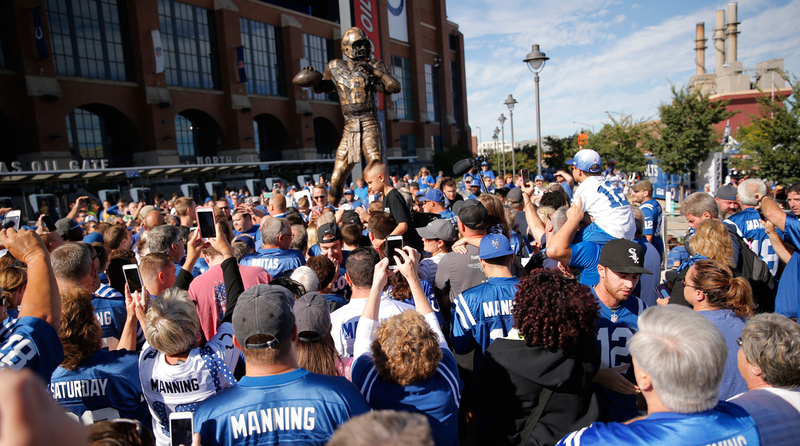 The Colts unveiled on Saturday a statue in honor of Peyton Manning, who spent 13 of his 17 NFL seasons with the franchise. So now Indianapolis, with its compact downtown jammed with hotels and restaurants, has hosted a Super Bowl—and the city performed so well the NFL might go back for a second one day. Indianapolis has won a Super Bowl. Indianapolis hosted had Final Fours, men’s and women’s. Indianapolis is even hip, with Manhattan-caliber restaurants like Bluebeard. On Saturday, with two big conventions and a Colts game on the slate, downtown was bursting at the seams; there was a line at St. Elmo’s. 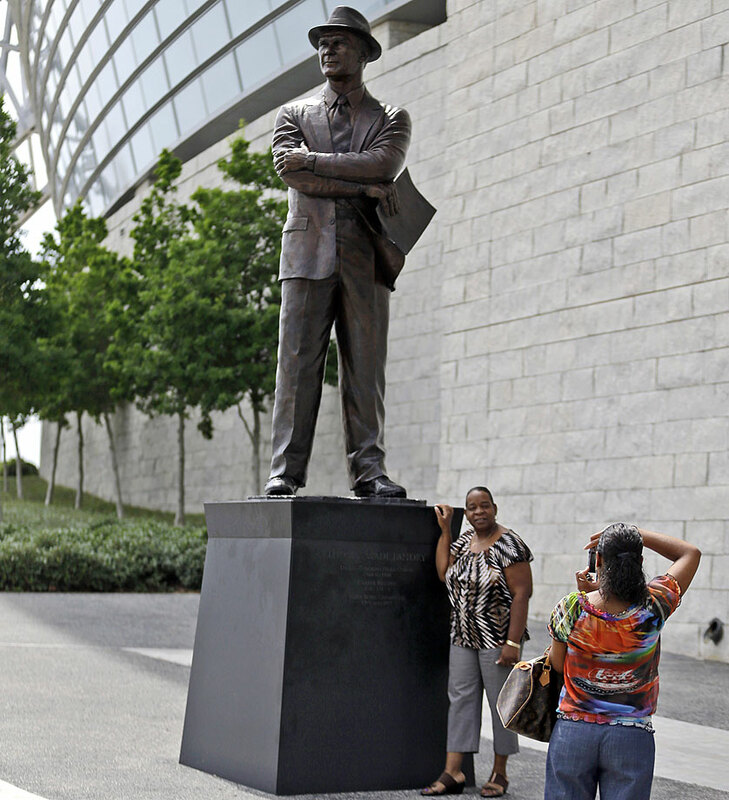 And a crowd of 10,000 to 12,000 people came to the city to watch the unveiling of the half-ton bronze statue for the man who, more than anyone, made it possible. GM Bill Polian always maintained that Lucas Oil Stadium got built on the back of Peyton Manning, and the former two-term governor, Mitch Daniels, echoed that in remarks to the adoring crowd. Locals were giving Daniels a hard time about the cost of Lucas Oil Stadium early this century, and he said: “Just build it. Peyton will fill it.” Fitting, too, that the shiny upscale JW Marriott—representing boom times in the first 17 years of this century for $320-a-night rooms in ritzy downtown hotels—could be seen through the legs of the bronze number 18. • There is no safe haven for Roger Goodell. The NFL can, and certainly will, slough off the reception for the commissioner here, but I found it notable, to say the least. The setup of the program paired speakers together, something I’ve never seen at a public event. The MC made a short introductory talk about each man and asked both to come up at the same time. One spoke, one sat between Manning and Colts owner Jim Irsay. Jeff Saturday, Manning’s longtime center, introduced (oddly) with David Letterman. Bill Polian introduced with the former governor of Indiana, Mitch Daniels. Goodell introduced with former Colts coach Tony Dungy. Now why were the speakers introduced this way? And why was Goodell introduced with Dungy, the most revered person in the crowd outside of Manning? Take a guess. When Goodell took the podium to speak, he was greeted by boos from—this is a very rough estimate—about half the crowd of maybe 10,000 to 12,000 fans. It seemed stunning, on such a celebratory day, with such good and warm feelings, that such a folksy town like Indianapolis would rain down boos on a commissioner who went out of his way to fly to Indiana to pay tribute to Manning. When Roger Goodell is booed in these environs, in front of a crowd ready to shower nothing but love on the dais … well, I am dubious, for as long as he is on office, whether he’ll ever rehab his public reputation. 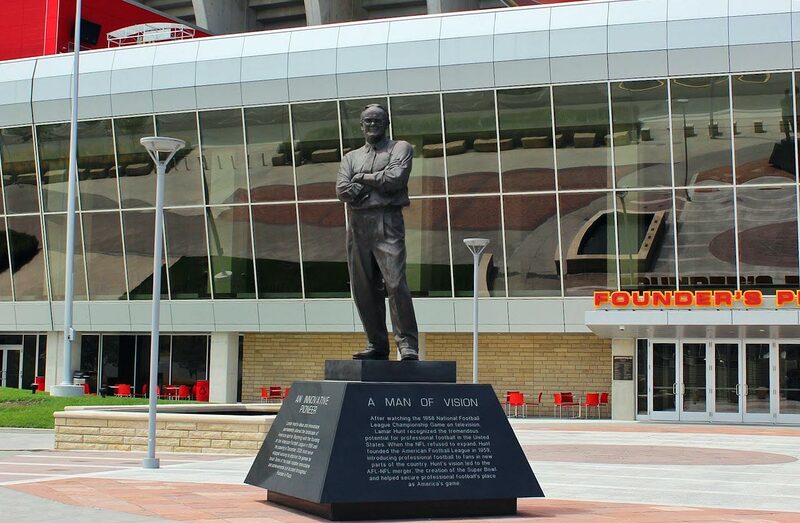 • Teams should build these statues and have these ceremonies more often. 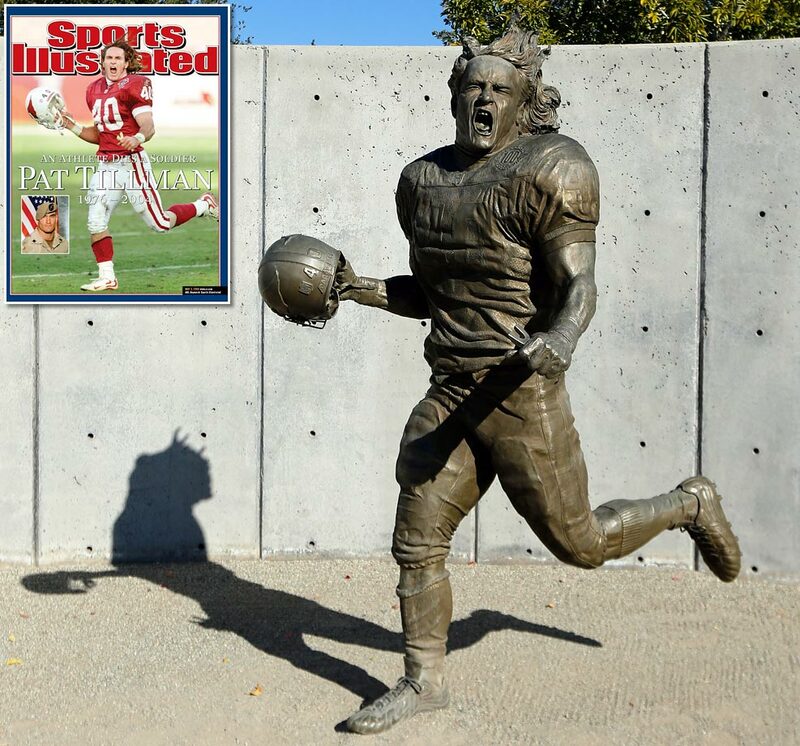 The Cardinals did it with a statue of the late Pat Tillman at their new stadium. 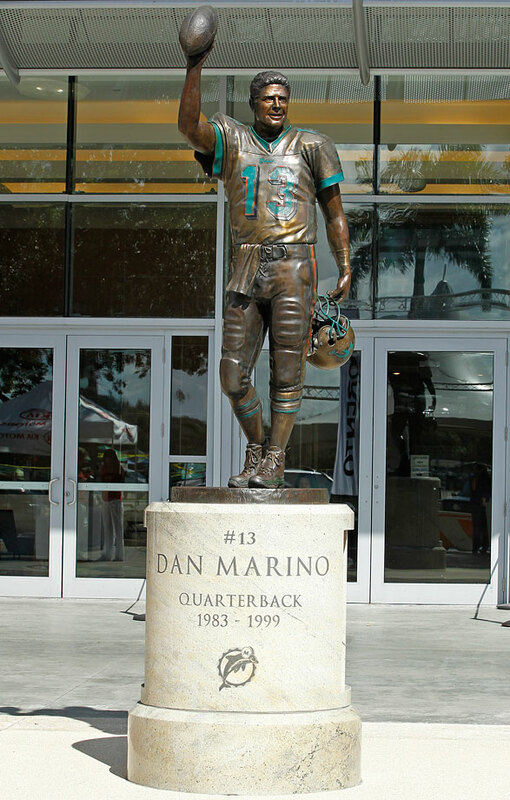 The Dolphins did it with Dan Marino, the Ravens with Ray Lewis. 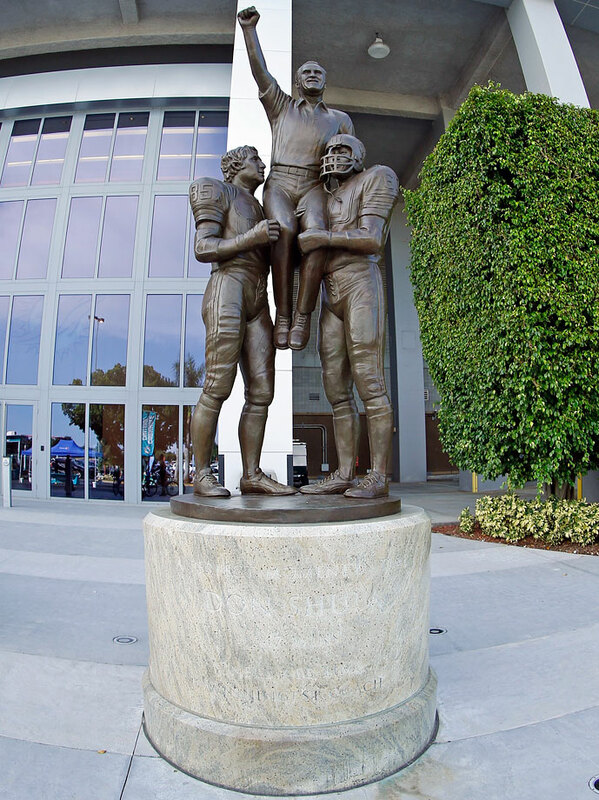 The Niners should build a Joe Montana statue at their new ballpark and let the fans pay their adoring respects. 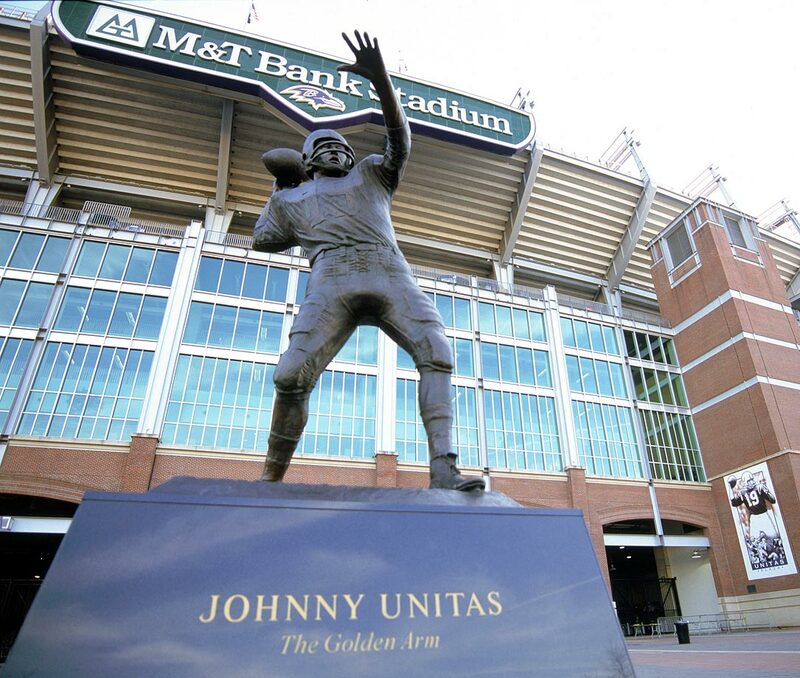 Ditto Cleveland with Jim Brown, Pittsburgh with Chuck Noll, Denver with John Elway, Dallas with Roger Staubach—and maybe with a triplet statue of Aikman, Smith and Irvin. 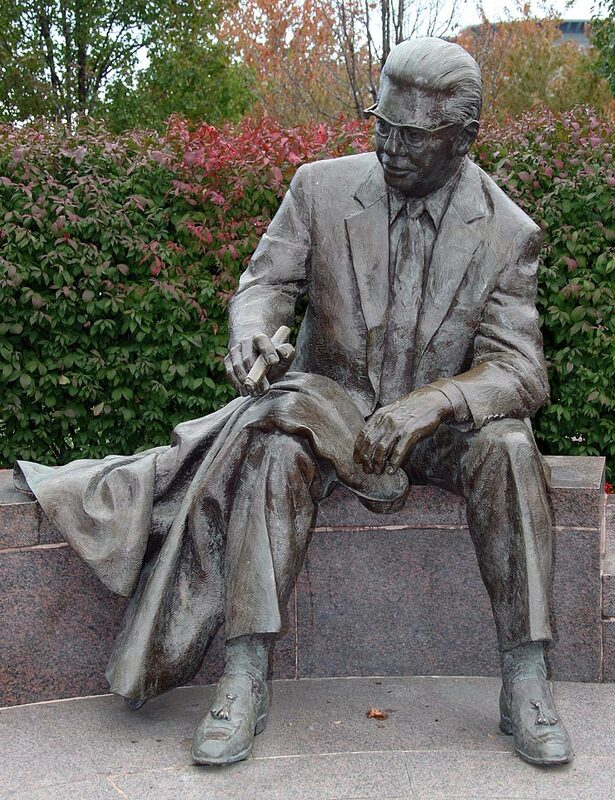 For years, folks will stop in the northeast corner of the plaza outside Lucas Oil Stadium, and fathers and mothers, sons and daughters, will take photos with the Manning statue, and those photos will go on walls and desks and mobile phone backgrounds, and not just in Indiana. Whatever the cost, it’s worth the current and future goodwill. • And for the record … It’s not just the business community that benefited from the effect of Manning. The Indianapolis area has $63 million worth of reasons to be grateful: $13 million from grants issued over the years through Manning’s foundation, and $50 million in money raised for the children’s hospital in Indianapolis that bears his name. We started our series (in partnership with State Farm) examining all levels of football—youth, high school, college and pro—with visits to the Bay Area and Charlotte. For the latest installment, Robert Klemko, Kalyn Kahler and videographer Steve Raum take us to Minneapolis-St. Paul and weave a tale of close-knit communities and the meaning of football there. Then we get into P.J. Fleck, and the youth game in the inner city, and the Vikings. We’re having a ball taking you across the country and showing you football America. Coming this week: Dallas-Fort Worth, where Jenny Vrentas and Kahler see a blend of big-time Texas high school football, college football and the Cowboys. The high school portion will be great—Americana, a great dance team, and a very diverse football roster. Leonard Fournette rushed 28 times for 181 yards for the Jaguars, who are alone in first place in the AFC South. a. Jameis Winston was inaccurate enough for three quarters Thursday night that, even though Nick Folk will rightly bear a good portion of the blame for the loss to New England, Winston’s misses on several third downs that could have elongated drives were collectively just as big a factor. Third downs converted in the first 43 minutes by the Bucs: zero. There were drops, but Winston has to be better—as does his team. b. Seems crazy that Tom Brady, in his 18th season and after 275 previous regular-season and postseason games, would have played his first game ever in Tampa against the Bucs on Thursday night. c. Patriots’ last 10 regular-season games on the road: 10-0. Patriots’ last 10 regular-season games at home: 6-4.
d. Sal Paolantonio with the ride along to work with Eagles coach Doug Pederson Sunday morning. Cool. e. Great story, too, by ESPN on the guy who stole Vince Lombardi’s hat on the field after the Ice Bowl … and finding the guy, a grandfather in Wisconsin, and getting him to divulge why in the world he would try to steal the hat off Vince Lombardi’s head. f. Myles Garrett knows how to make a debut. On the first snap of his first NFL game, the first pick in the draft sacked the quarterback—Josh McCown, in this case. g. Brilliant play design by the Panthers in Detroit, and great orchestration by Cam Newton, to fake the read-option and shovel-pass the ball inside to Christian McCaffrey, his first touchdown of his NFL career. h. DeShone Kizer leaves the pocket too soon. He’s got to calm down, hang in and give his receivers a slightly longer chance to get free. “He does tend to be a one-read quarterback sometimes,” Ronde Barber correctly analyzed on Fox. 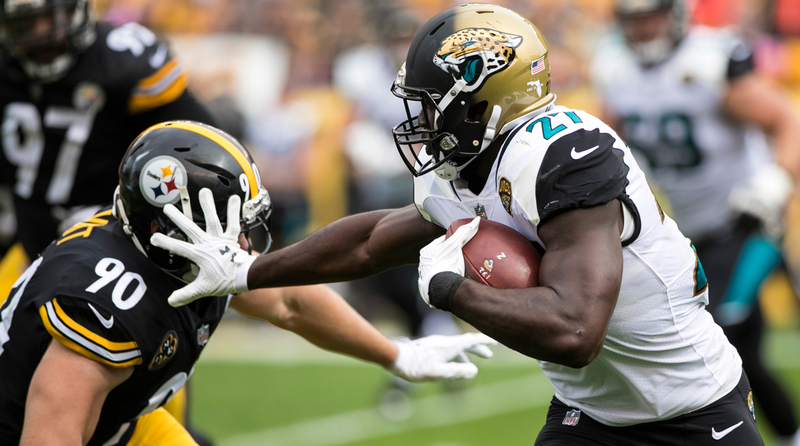 i. Jags back Leonard Fournette, a vet of five NFL games, has scored one touchdown in each. j. Looks like I was a year too early on the Titans. Or I was dead wrong in singing their praises so loudly. k. This may be faint praise, but cornerback Jason McCourty has been the best player on the Cleveland defense this year. His first-quarter interception of Josh McCown was the kind of perfectly anticipated play that a smart cornerback makes. 2. I think Cam Newton’s words of apology Thursday night were promising. But none of us except Newton knows the deep-down sincerity of his apology for what he said to a female reporter on Wednesday. (When Charlotte Observer reporter Jourdan Rodrigue asked Newton about pass routes, Newton responded that it was funny to hear a “female” talking about “routes.”) Newton has been widely derided for his smirky 1981-era putdown. That’s all justified. I liked his apology, and it seemed sincere. But I’d make two points here. One: Why’d it take him 30 hours to apologize—and, to a lesser degree, why didn’t he include the reporter in his apology? The fact that he took 30 hours to say he was sorry is concerning. Did it take him longer than a day to realize he was wrong? Or did he know he was wrong and simply took time to do something well thought-out? Two: It makes no sense right now to say, “Great apology. We’re all good.” This is now a wait-and-see thing. Newton said all the right things, and they appeared heart-felt. But it’s his actions now that will speak for him. 3. I think when the Falcons built this beautiful new $1.5 billion downtown stadium, team officials were quick to say they wanted an open-air stadium. Finally, many said; it’s madness that a city in the south, a temperate, lovely American city with a great climate, would have a domed stadium. So the Falcons built a retractable-roof stadium. The roof was open for one game, the opener against Green Bay. And the team announced Thursday it would remain closed for the rest of the football season—it also will be open one soccer game, for the Atlanta MLS franchise to presumably break the single-game MLS attendance record Oct. 22—and then closed for the rest of the season. The reason is because of problems with the mechanization of the roof panels. Getting that roof open has to be priority one for Arthur Blank. Domes stink. Roofs should never be closed, save for relentless precipitation or extreme heat/cold. The Colts abuse it, keeping the roof closed on beautiful Indiana days. Blank has to make sure the problem with the roof is fixed ASAP. 6. I think the most perfect headline of the week was this from Deadspin: “NFL Assures Fans There’s No Tolerance For Racial Slurs At Redskins Games.” It was the perfect response to the NFL saying it would look into Washington wideout Terrelle Pryor’s claims that he had a racial slur directed at him at Kansas City last Monday. 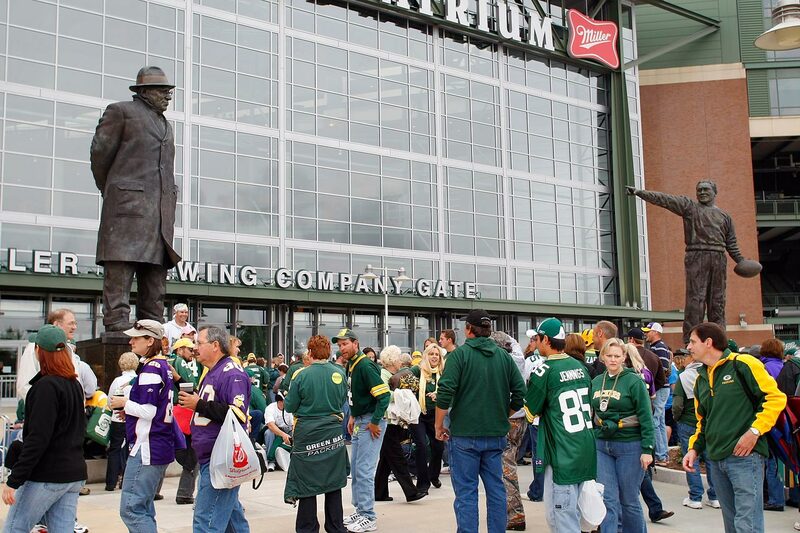 There will be “no tolerance” for such language in NFL stadiums, an NFL spokesman said. Except, of course, for the name of team that employs Pryor. Washington’s team name, according to Dictionary.com, is “a contemptuous term used to refer to a North American Indian.” Dictionary.com says “redskin” is “disparaging and offensive.” But that’s okay with the NFL. 7. I think I have never seen the Browns look worse, and that’s saying something. a. Story of the Week: by Caitlin Flanagan of The Atlantic, an examination of the death of Penn State student Tim Piazza at a campus fraternity. Harrowing, beyond disturbing, superbly reported, and very well written. b. You read that and wonder how young human beings can have such callous disregard for Tim Piazza’s life. And why Penn State looks the other way while hazing and stupid amounts of drinking happen at fraternities. It’s disgusting. c. According to Piazza’s father, no officials from Penn State went to Tim Piazza’s funeral. Galling. e. Las Vegas Story of the Week: by Wesley Lowery, a fellow Ohio Bobcat, on a friendship between two strangers forged when a mass murderer struck a week ago. g. Is it okay to talk about gun control now? Or are we still in the “thoughts and prayers” period? h. Is it okay to ask if the rights of the 59 slain people matter, compared to the rights of the gun industry, or compared to the rights of a sane-seeming maniac who stockpiled 46 weapons with multiple add-ons that make guns fire like automatic weapons? i. Jose Altuve: the perfect baseball player. Carlos Correa: close to that. j. Houston and Cleveland are so good that it’ll be a shame when one of them doesn’t get to the World Series. Both have answers through the lineup. Both have great bullpens (Cleveland a little better, but Chris Devenski is a good imitation of Andrew Miller) and tough outs through the lineup. The other day Brian McCann batted ninth for Houston against Boston; he’d have been the fourth- or fifth-place hitter for the Sox. k. Eric Hosmer needs to be on the Red Sox’s free-agency wish list. l. The Diamondbacks’ uniforms are so hideous that they’re starting to grow on me. Not the hats, though. The hats are legitimately heinous. Speaking of National League uniforms: Can the Rockies do something with theirs? And preferably not in purple? m. Coffeenerdness: You’ve got to put a little pep in your baristas inside Penn Station in New York, Starbucks. Man, those are some lackadaisical men and women. Twelve to 15 minutes’ waiting time is not good. n. Beernerdness: A bit of an unusual beernerdness this week … it’s Sober October for me. When you read this section every week, don’t you sometimes wonder, Is Peter King a raging alcoholic? Well, I don’t think so. But I do think moderation is good, and after a summer beering while riding around to training camps and being out with peers and NFL contacts and my team at The MMQB, I thought it would be smart to take a break. First, to see if I can do it (and so far, I haven’t had to beg my wife to please, please, please know I was kidding and I didn’t really mean to refrain for 31 whole days). Second: because it’s healthier. Now, this won’t be forever, and it’s only been eight days, but it’s been a good change-of-pace. Maybe next week I’ll regale you with Seltzernerdness. Come to think of it: Let’s have guest Beernerdnerdness entries for the next three or four Mondays. If you’ve got a beer you love, and you can describe why in 75 words, send to talkback@themmqb.com. o. Glad I’m not Jacque Jones today. Or ever. p. Headlines Are Fun Dept. : Yankees manager Joe Girardi failed to challenge what became a monumental call in Game 2 of the ALDS on Friday. Cleveland’s Lonnie Chisenhall was given first base on a hit-by-pitch with two outs in the sixth inning, enabling the inning to continue, and enabling Cleveland’s Francisco Lindor to hit a grand slam in an eventual 9-8 Tribe win. The New York-area press was (mostly) not kind. w. RIP, Tom Petty. And thank you very much. x. Finally, one of our ace editors and a huge influence in the founding and development of this site, Matt Gagne, is leaving The MMQB later this month for a top editor’s job at Men’s Health. When I first was handed the keys to this car in 2013, Matt and I spent hours discussing personnel, strategy, website design and stories we wanted to pursue. He has not once been wrong about a staffing decision we made. Matt has been invaluable in whatever impact we’ve made in this business over the past four-and-half years, and I’ll be forever grateful to him. His editing skills, the ability to make copy sing, is a vastly underrated part of any site’s success, and certainly this one’s. Matt is a growth stock. We’ll miss him, but I’m excited for him and his wife and two young children as he makes this move. Minnesota 31, Chicago 13. The Mitchell Trubisky Era begins in Chicago. (I’m a guest every week on the “Waddle and Silvy” radio show in Chicago afternoon drive-time, and in the first five weeks of this season I think they asked me 913 times about when the right time would be to make the switch from Mike Glennon to Trubisky.) The hot breath of Trubisky basically melted Glennon, who would have had a hard enough time winning and proving he was more than a career backup anyway. That will be the story of the pregame tonight. But when the game starts, I like the Vikings big, whether Sam Bradford retakes his starting job or not. That’s because the Vikings have two good quarterbacks right now. The passing line of backup Case Keenum (Pro Football Focus’ sixth-rated quarterback entering the weekend) in the past two games: 65 percent accuracy, 588 yards, three touchdown, no picks, 111.1 rating. Can’t see the Bears stopping either one. Stick to sports, you say.